Copyright (c) 1994-2011 William F. Maton. Todos los Derechos Reservados. What's New for 1 September, 2011? If anyone has any information to the contrary, please send info along, thank you. If anyone has something to contribute to this archive, like historical legal documents relating to the evolution of Canada, feel free to drop me a note. Don't get too excited, there's only a few Acts on-line, under sections C, I, Y and J. These are the Acts mentioned in the footnotes to the Consolidation of the Constitution Acts, 1867 to 1982. Note that this section is complete insofar as references by the Consolidation of the Constitution Acts, 1867 to 1982, are concerned. You may try Canada's Department of Justice Web server for an almost complete selection of Acts in force today. Generally speaking, these are the Acts that one finds in the Revised Statutes of Canada, 1985, but are updated to include recent changes. To get a full sense of which laws are really enacted now, and to find which Ministers of the Crown are responsible (i.e., which Minister in the government is responsible for the law in question), you have to consult the Table of Public Statutes, available through the above site. 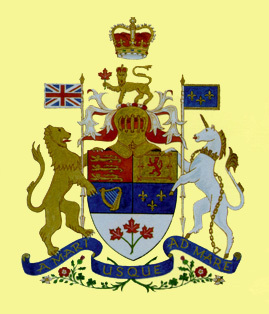 New: The Canada Gazette, Parts I through III are now available at the Ministry of Public Works and Government Services web site. The Canada Gazette, among other things, publishes notices of new laws, orders-in-council, and constitutional amendments. Well....just a couple. Specifically Treaty Numbers 2, 8 and one of the Robinson Treaties. You can find all rulings dating back to the beginning of 1983. Hopefully, the archive will expand to include the older rulings as well. The Constitution of Mexico. In HTML and Acrobat PDF formats. Current to March 20, 1997. Reforms of the Constitution , covering every change made since 1917, or since the law in question was first promulgated, provided by the H. Congreso de la Unión (Federal Congress). El Codigo Civil de México (The Civil Code). An old copy, plus the newest one, current to October 31, 1997. El Diario Oficial de la Federación. This is roughly the Mexican equivalent to Part III of the Canada Gazette, which announces, among other things, the passing of legislation or decrees (orders-in-council) into law and other reports as prescribed by law. The InfoJusWWW (Instituto de Investigaciones Jurídicas, Universidad Nacional Autónoma de México) server is now providing all the constitutions of the country's states, including the federal one, plus all other laws. See this Best of the Web , Document Design, '94 Nominee rendering of this document at Cornell's Law School. The Constitution of France, otherwise known as the Constitution of the Fifth Republic is here in French. The Russian Constitution is here and in Russian. This is the constitution that succeeded the Soviet Constitution. To view it, you need Cyrillic fonts, either for Windows or for X-Windows. This version may be out-of-date. The Japanese Constitution is available in English or Japanese. Please note, the Japanese version requires a browser capable of interpreting and viewing Kanji characters. The Irish constitution is reproduced in both Irish Gaelic and in English. The constitution of the Slovak Republic is available in English. The General Agreement on Tariffs and Trade is available here, as well as the North American Free Trade Agreement. Want some more? There's lots out there listed in my legal resources page, or alternatively, refer to the The World Wide Web Virtual Library: Law section of the Virtual Library. Please send me your comments or suggestions! I'd love to here from you. Last updated: 1 September, 2011. Copyright (c) 1994-2011 by William F. Maton. Reproduction of any of these documents without permission strictly prohibited.